We flew from Manchester to Rome Ciampino with Ryanair. I know what you’re thinking – Ryanair eugh – but when I’m flying budget or short haul, I almost always fly with Ryanair. They are usually the cheapest (I always use Skyscanner to find the best value flights to my destination). Yes Ryanair are no frills but they’re also no fuss, a flight with them is quick and easy. We got an early morning flight out of Manchester which meant that we had to be up at 2.30am (argh!) for a foggy drive over the tops to the airport. 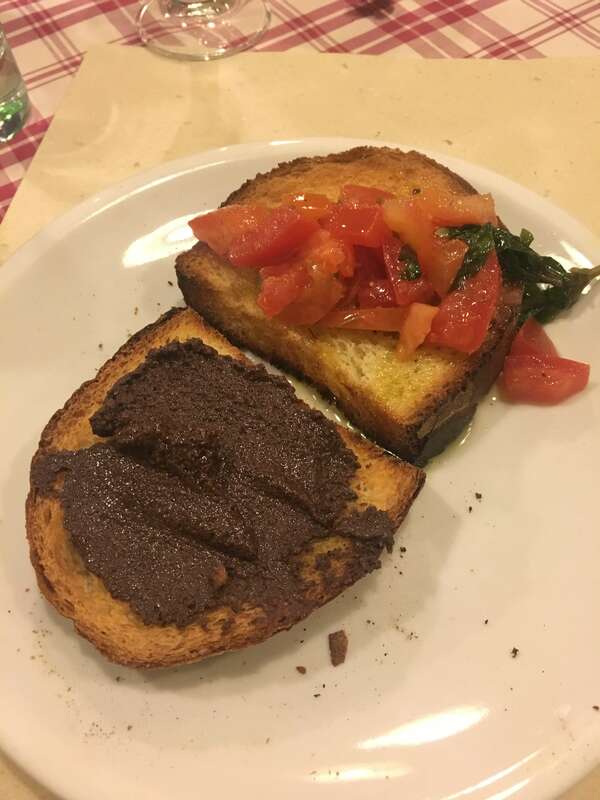 I booked an early morning flight so that we could make the most of our first day in Rome, with us only being there for three full days (we flew home in the morning on the fourth day). 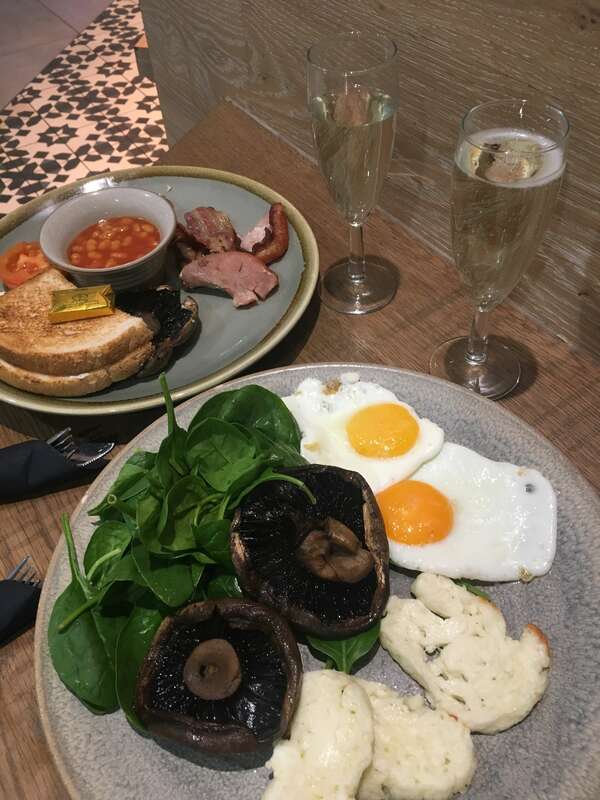 We had the traditional pre-holiday breakfast once we got to the airport and, of course, a glass of prosecco – no holiday (or any other day!) is complete without it! We arrived in Rome about 10.30am and took a taxi to our hotel. I’d heard a lot about taxi scams in Rome before we left and so I was super wary of this – it’s a flat rate of 30 euros from the airport to the city centre so make sure this is agreed with the driver before you leave and always get in a white taxi – these are the official ones. I’ve heard the train and bus are pretty easy to use but we didn’t want to waste too much time finding them and getting to our hotel. We stayed at the Hotel Miami which was quite basic but spacious enough with a double bed, dressing table and large en-suite bathroom. The staff were lovely and gave us a map at reception with routes to all the major tourist attractions marked out on it. 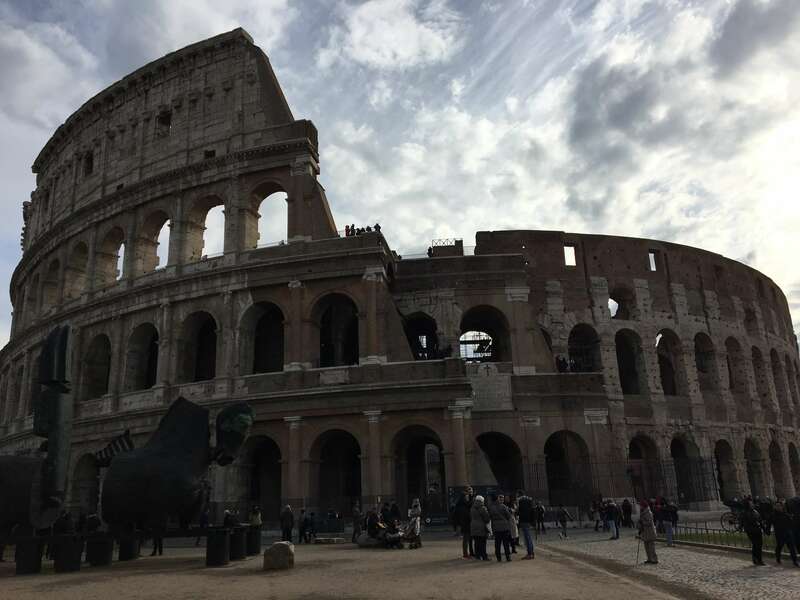 The very best thing about the hotel was the location – it was only a 20 minute max walk to the Colosseum and to the Trevi Fountain in the other direction, even the taxi driver said it was a great location! My brother helped me to pick the hotel on booking.com as he visited Rome last year – well done Josh! 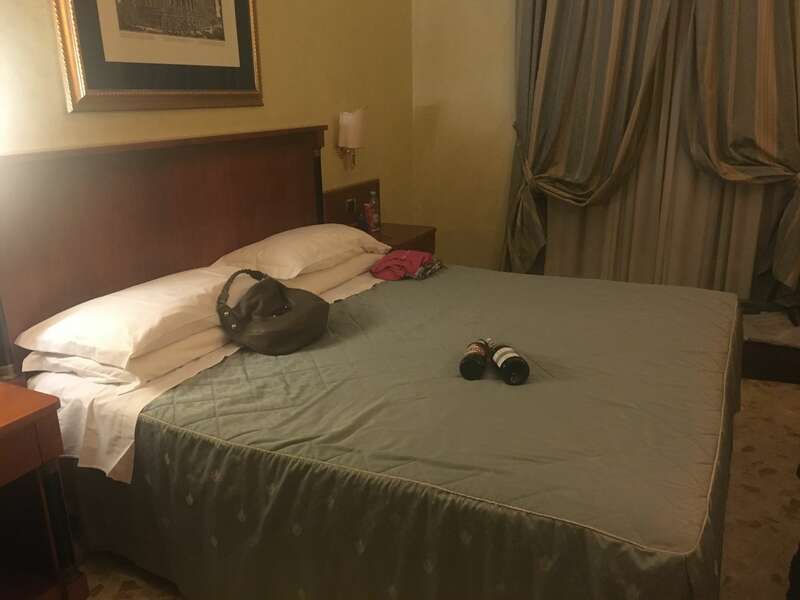 Location is everything in Rome as you’ll not be spending too much time in your room – you’ll only be falling asleep there after a really busy day – so I would definitely recommend the Hotel Miami, especially if you’re on a bit of a budget. After dumping our bags and putting a few more layers on (did I mention it was FREEZING?! ), we headed straight out to visit the Colosseum. Neither of us being all that proficient with a map we wandered off in the completely wrong direction at first but stopped to look at a fountain that was at the top of the road, in the Piazza della Reppublica. It had been so cold that the fountain was frozen over! In Rome there is something to look at around every corner – amazing buildings and architecture and things you will never have heard of so you’ll have to check in the guidebook later. After our little detour we walked towards the Colosseum. I can’t describe my feelings when we rounded the corner and glimpsed it for the first time. It’s so huge and impressive that it almost doesn’t look real. I felt kind of emotional and overwhelmed – it was just amazing. With it being January it was pretty quiet so we only queued for a short time before being able to go in. There are guided tours available but we chose to purchase the audio guide instead (although we didn’t exactly follow the proper plan!) and look around ourselves. I loved the audio guide as it told us all about the games that used to happen in the Colosseum, where all the different classes of people sat, and how it had been restored over the years. It cost 12 euros each to get into the Colosseum and this gives you access to the Roman Forum and Palatine too. It’s also cheaper if you’re under 25 (sadly I’m not!) and have your passport to prove it. We spent a few hours wandering round the Colosseum and then decided it was time for a spot of lunch. We stopped for lunch at a beautiful little restaurant, La Bottega del Caffe, which has a terrace outside which I can only imagine would be beautiful (and crazy busy) in the spring/summer. The pizzas looked amazing but we opted for a mozzarella and Parma ham sandwich (so that we could really make the most of dinner later!) and a couple of glasses of prosecco (when in Rome!). We decided to take a stroll back to the hotel and have a quick nap before going out for dinner later. I did a little bit of research about where to go for dinner but as it was our first night, we wandered around the streets near out hotel to get our bearings and to have a look at everything before we headed into a large restaurant called Wanted. We had a fresh tomato and olive paste bruschetta to start with followed by a Parma ham, mozzarella and mushroom calzone for me and pasta for the boy, which we ended up pretty much splitting. Again, we had a bottle of prosecco! The food was lovely but didn’t blow me away but we found this all over Rome. We headed back to the hotel after a few hours at dinner and then fell asleep almost straight away after our busy first day.